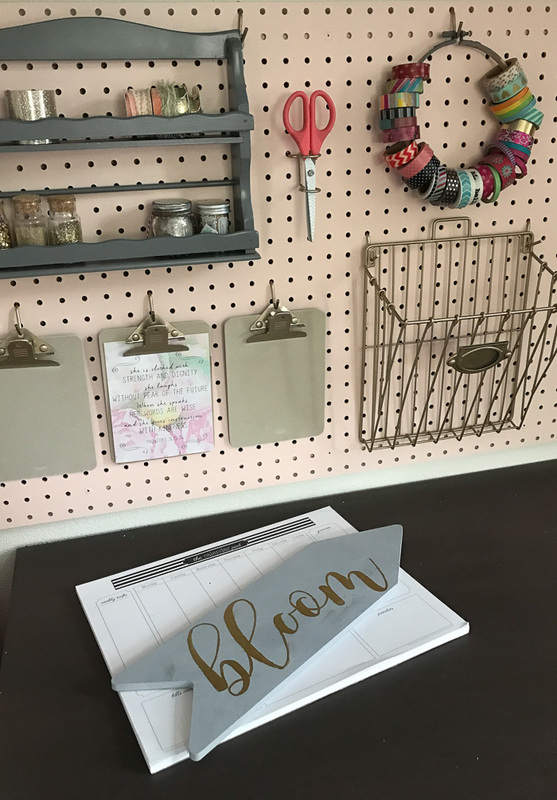 It’s week 4 of One Room Challenge and my guest room makeover is coming along! Here are my plans for the room, if case you missed week 1. 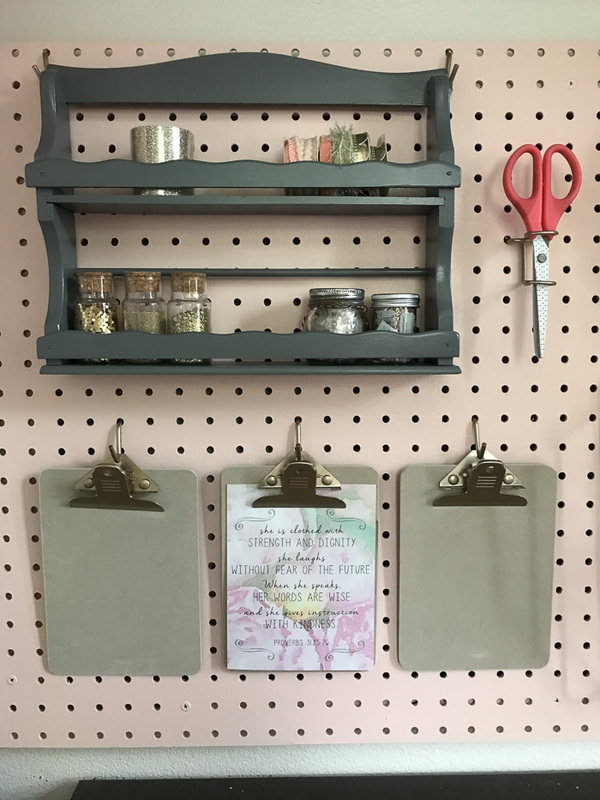 I’ve also got a craft closet in this room so this week I starting work on painting the pegboard and spray painting all the things to match the gray, blush, and gold color scheme. 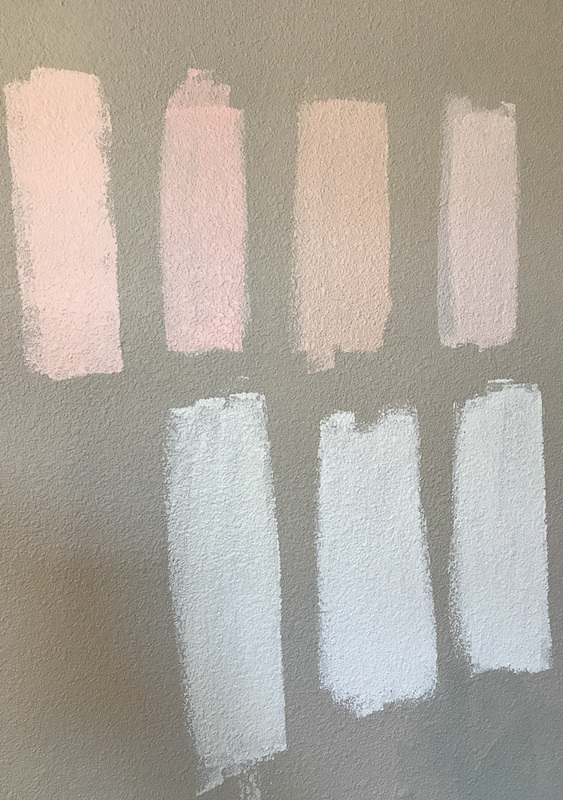 Last week I shared the colors I was considering. 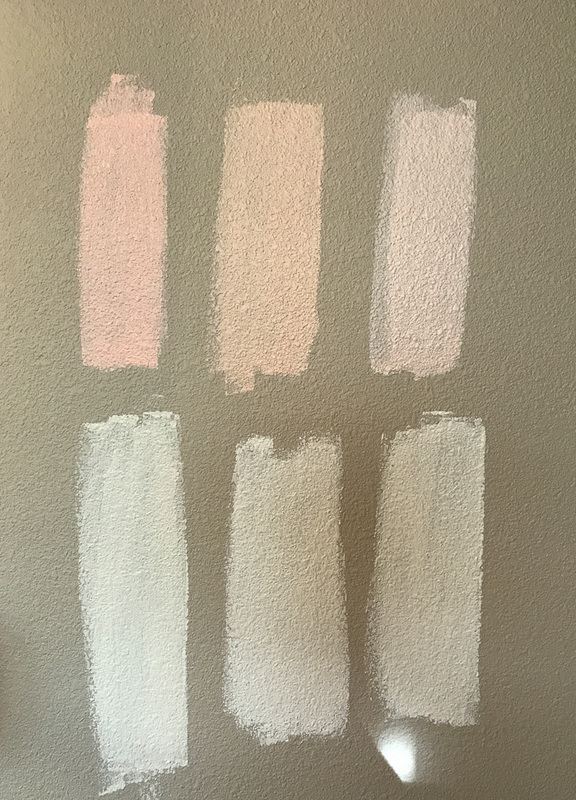 I put the samples on the wall and looked at them in both daylight and artificial light and decided that (left to right) Coral Perfection was too dark, Romance was too peachy, and Angelic was too pinky. 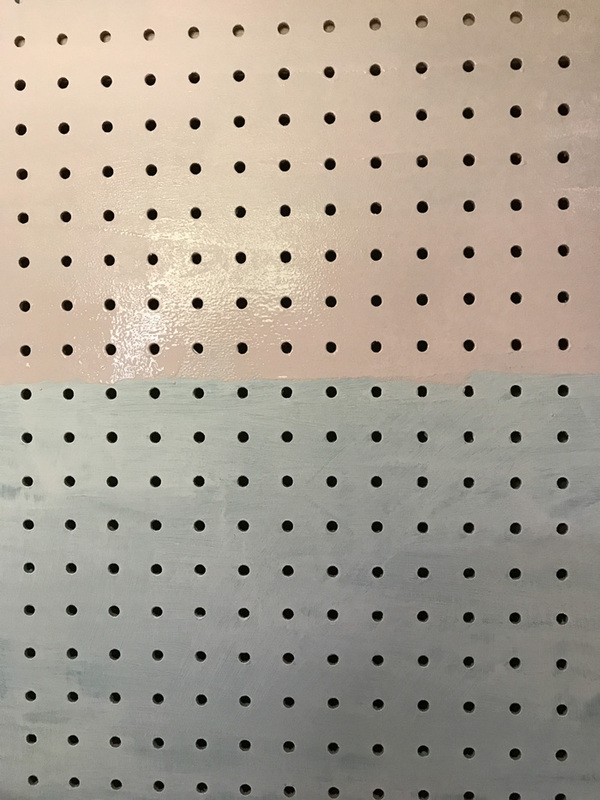 So I went to Sherwin-Williams and found Comical Coral, which I loved, but it was a little too dark so I had them take it down to 75 percent. That (far left) was more what I was thinking. 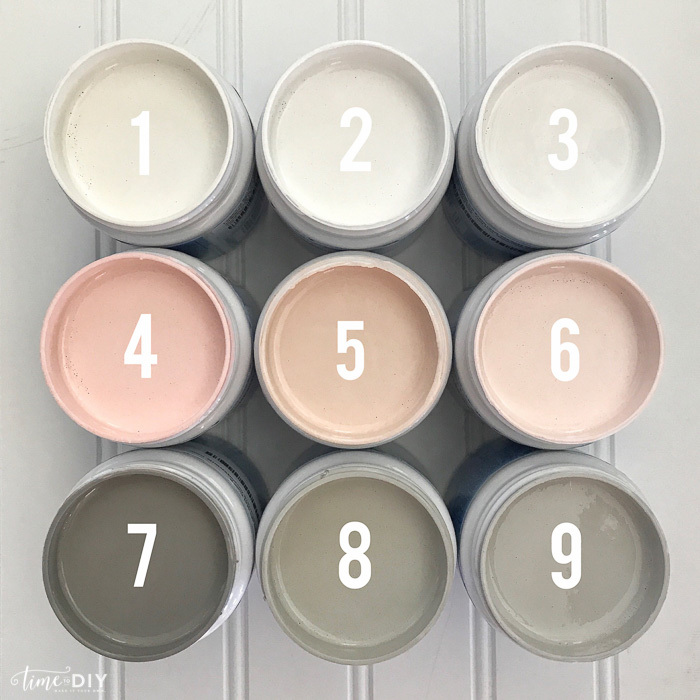 I also got a couple gallons of Alabaster white (far left) for the walls and faux shiplap, and that will be week 5’s project! 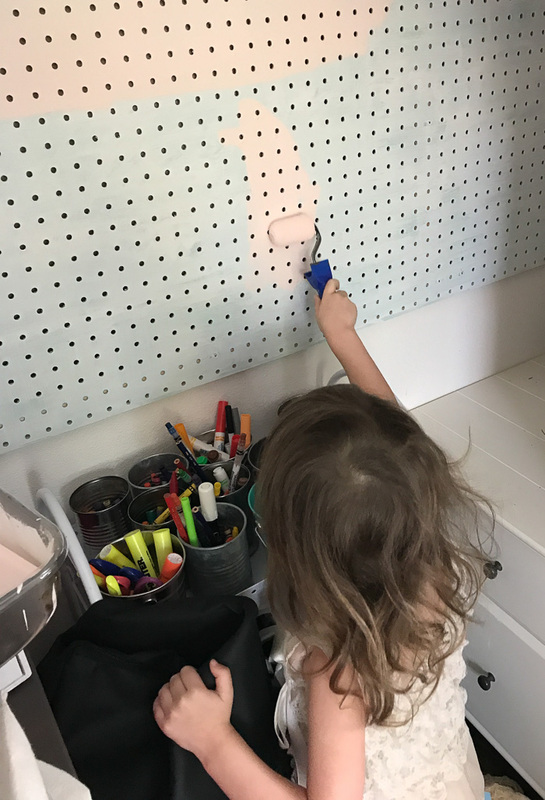 My daughter is a my little helper! 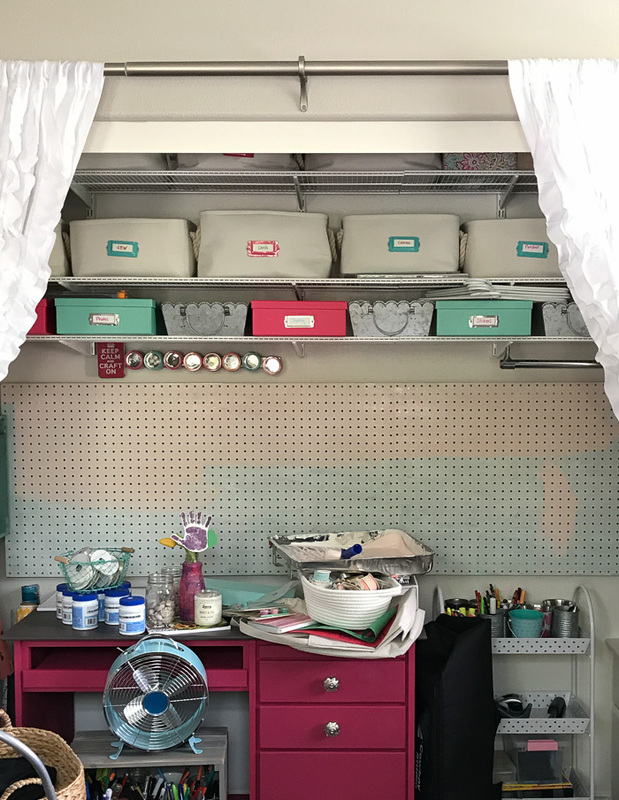 So, the craft closet. 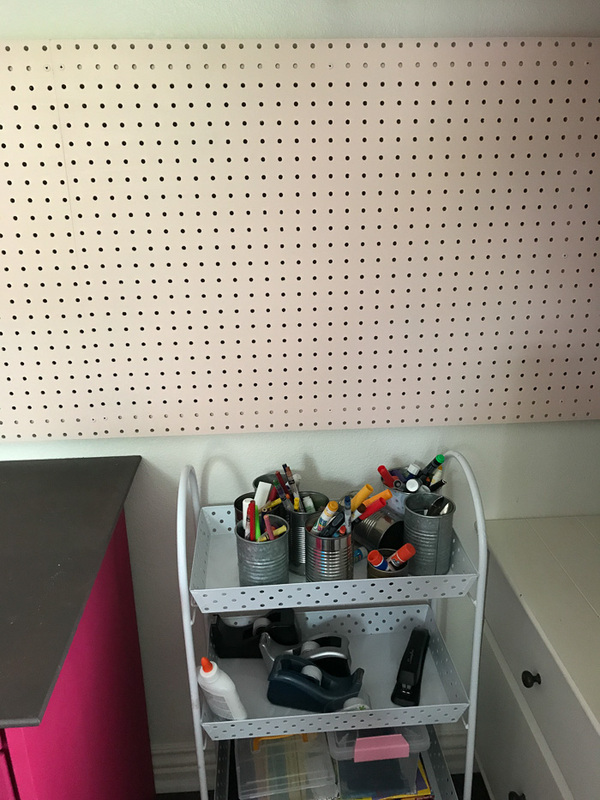 I kept going back and forth between a white and blush paint on the pegboard, so I decided to try white first. And it didn’t work for me, so I went with the blush (Coral Perfection at 75 percent). And that was more my jam. 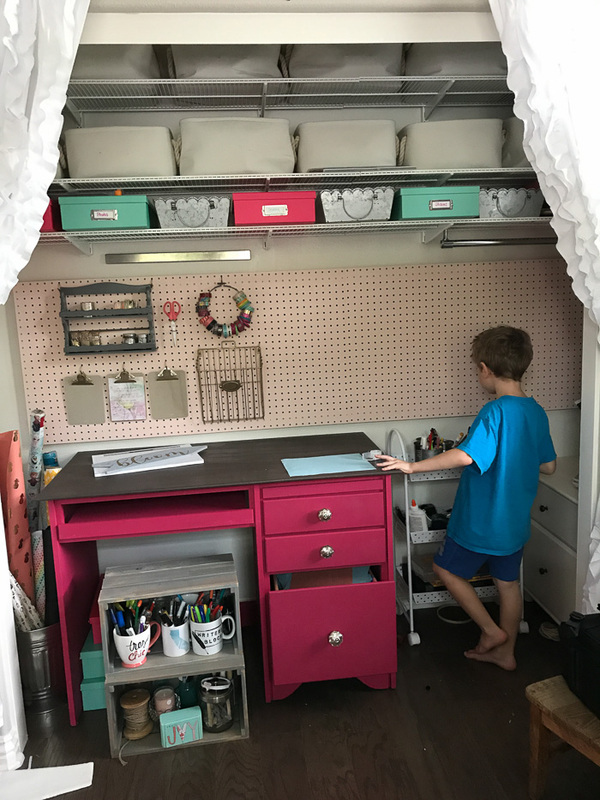 Try to ignore all the old hot pink and mint colors, and picture the desk gray with gold accents. 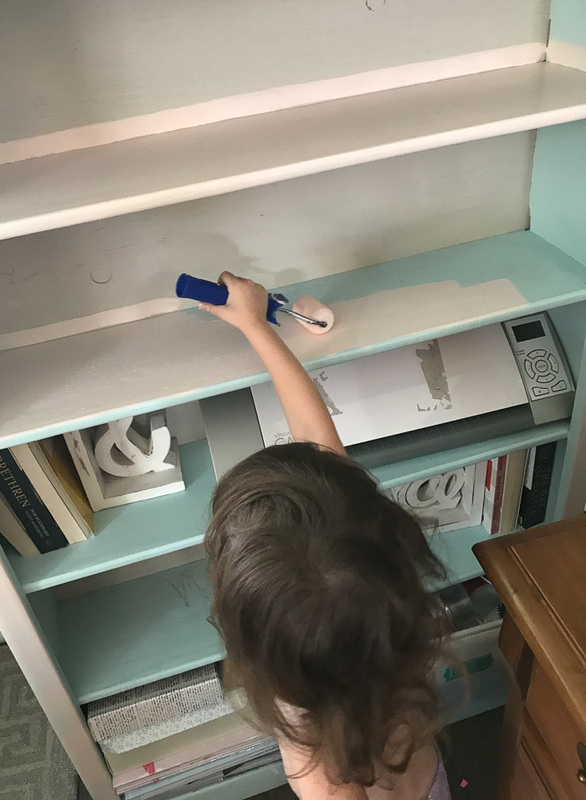 Because I had a bunch of paint out and the roller ready, I decided to tackle the bookcase as well. 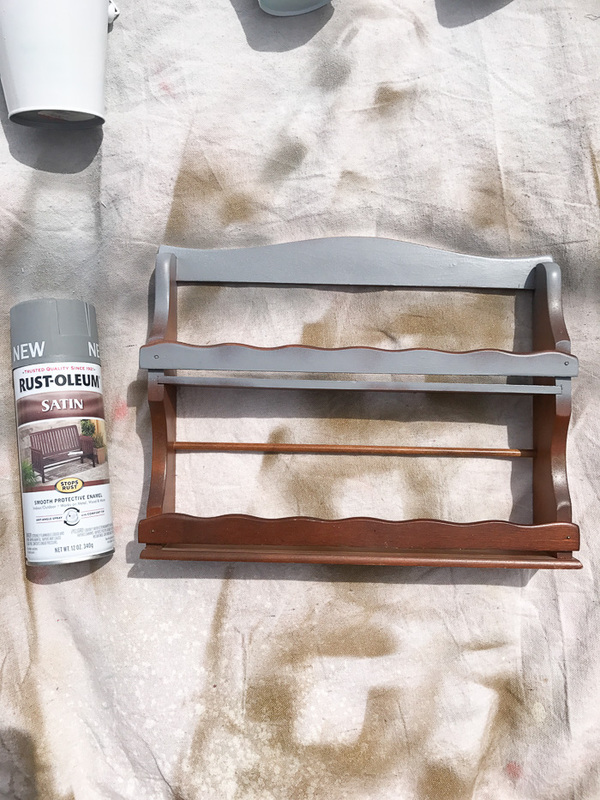 This is my first time using Sherwin-Williams ProClassic paint (specifically for furniture) and so far I love it! 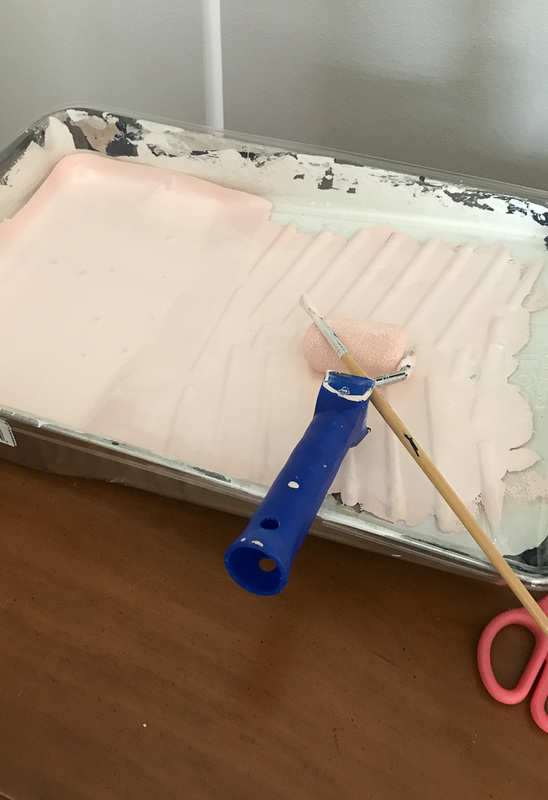 I painted over wax, and it went on smooth, dried quickly, and I only needed two coats. But more on that later. 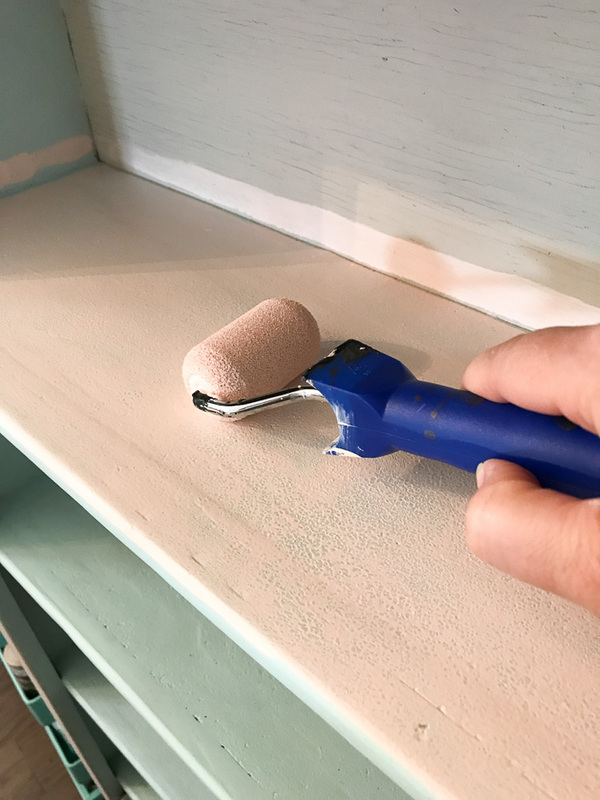 I did the whole thing with just this roller and this small brush, and it was crazy fast. I think I’m going to put leftover wallpaper on the back of the bookcase. 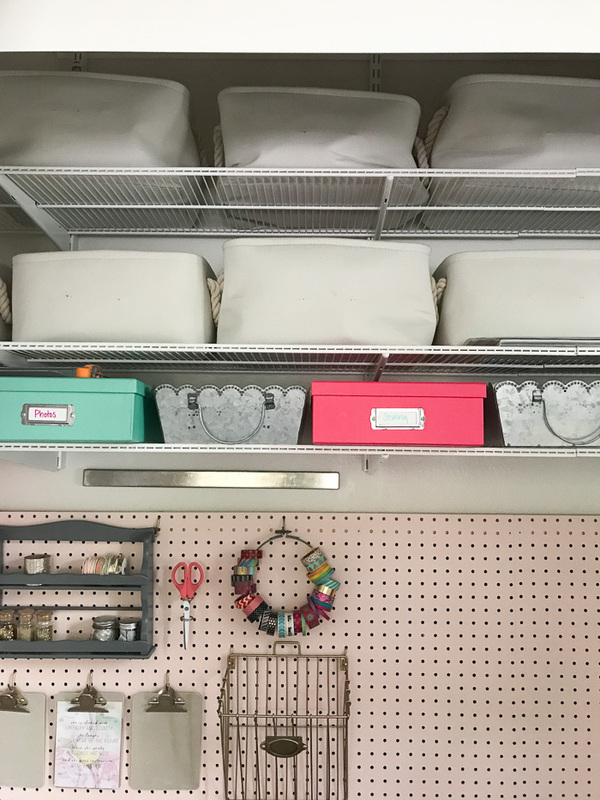 I also started spraying my craft closet contents. 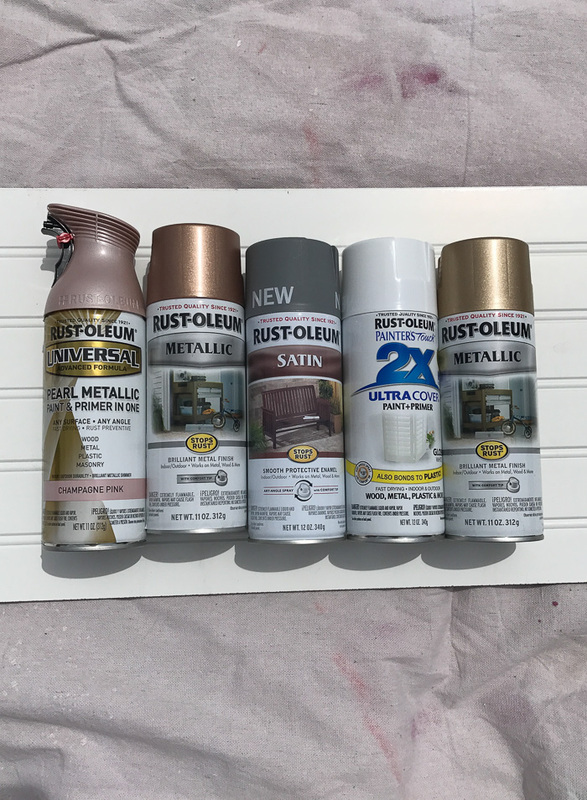 I chatted with Rust-oleum at SNAP last week and was so excited about their new colors! Aren’t they pretty? They sent me some to try out and I wanted to use ALL them! And I was all heart eyes over that champagne pink! I will be sharing more of some fun new things later. 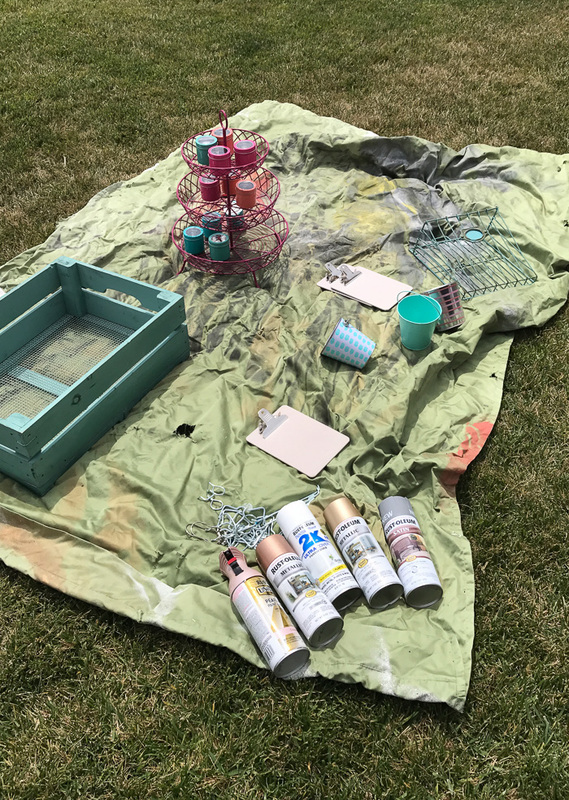 Before spraying, I created an “on deck” area (so.many.things to spray paint!). And then had my own person spray paint party! I’m trying to use what I have, but switch out the colors. That was my grandmother’s spice rack in her kitchen! 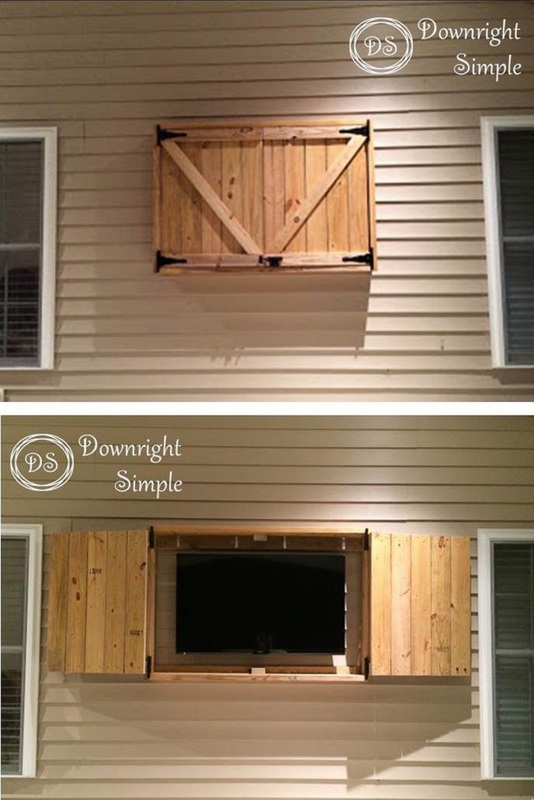 I’m excited to finally give it a makeover and get it up. 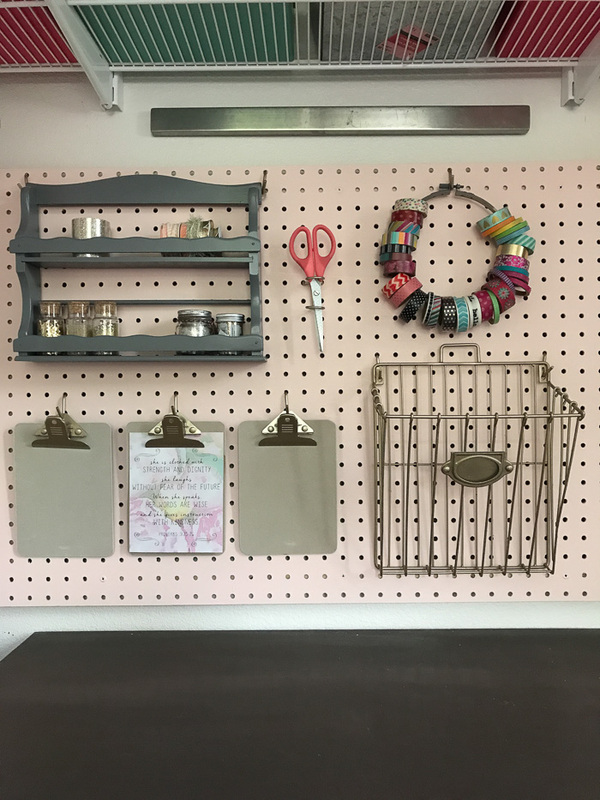 Will be so great for craft storage. I started putting things up, but I’m sure it will change about 27 times before I post the final reveal. 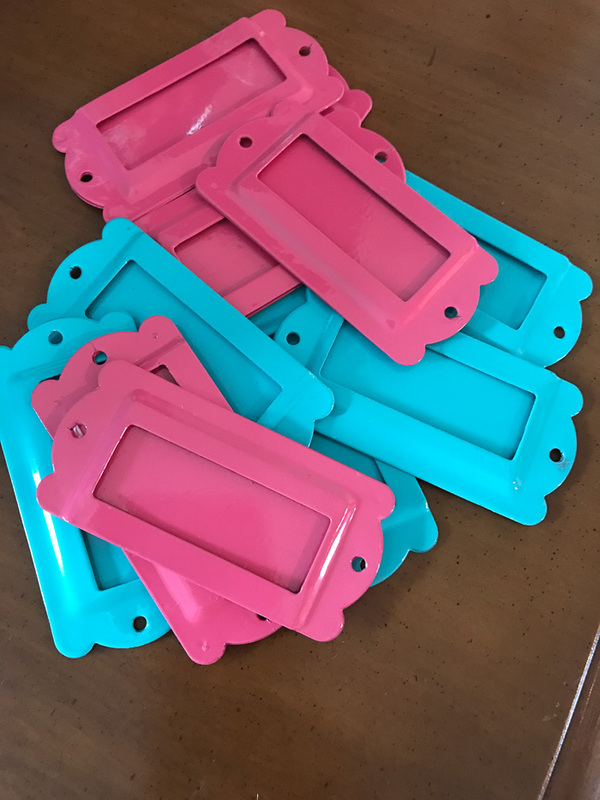 Again, ignore all the pink and mint! 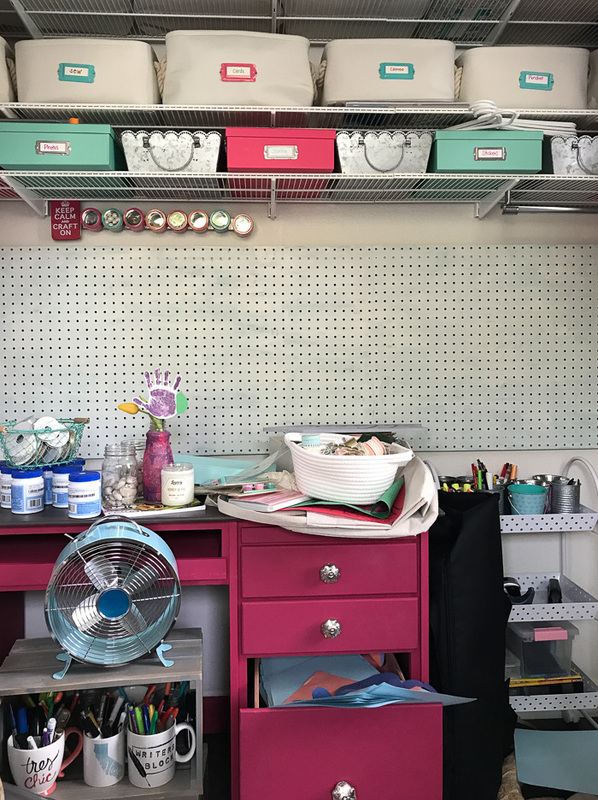 I made that arrow at the DecoArt booth at SNAP, and once I finish it, it’s going to be perfect for this space. It’s still a mess, but we’re making progress. 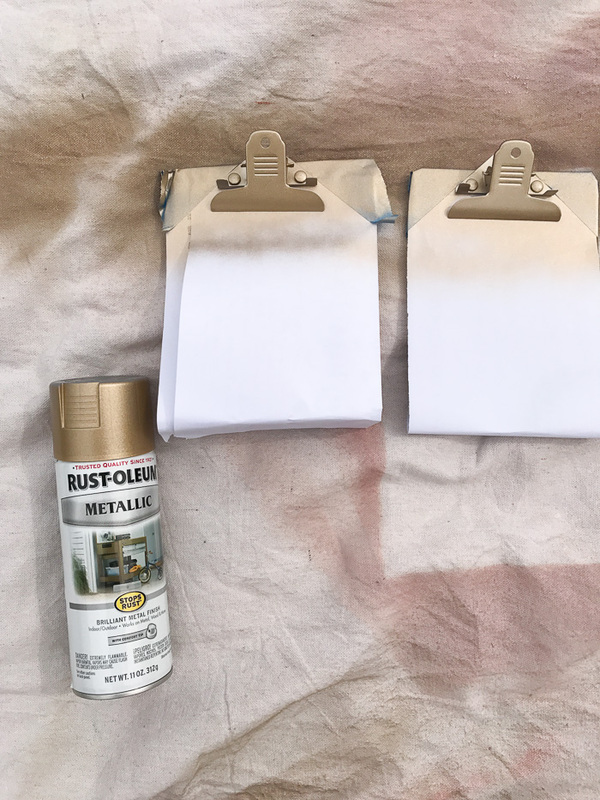 I took off all the tags from the bins and they will get the spray next! 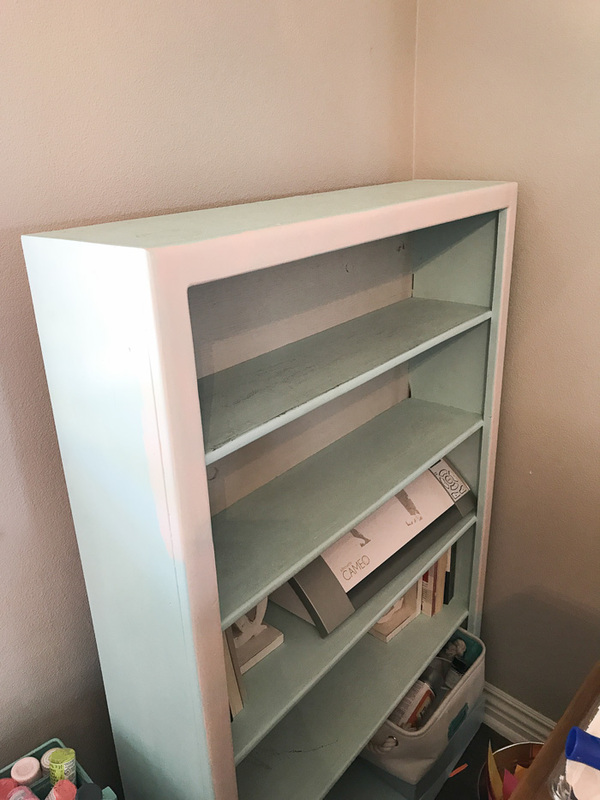 Painting and shiplap next week, and I think I want to put a cabinet over the TV, like this one. Working on getting a professional to help me out with that one. 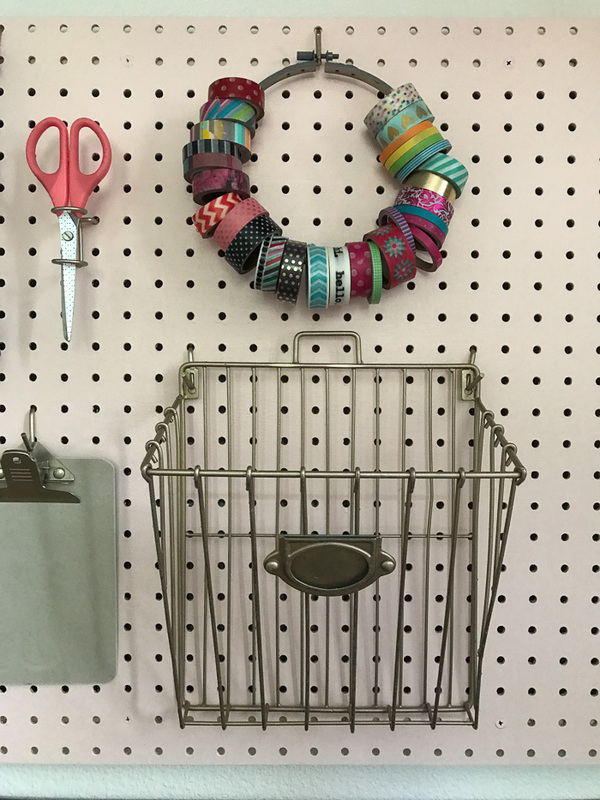 I love your new color scheme and that washi tape holder is adorable!! 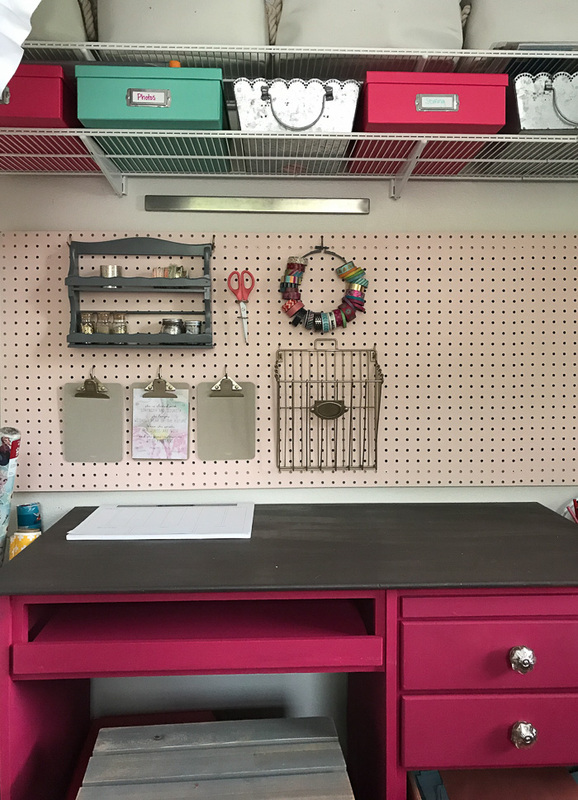 I used comical coral down 75% in my little girl’s room. It is so pretty! How funny, Melissa! It’s such a great color! 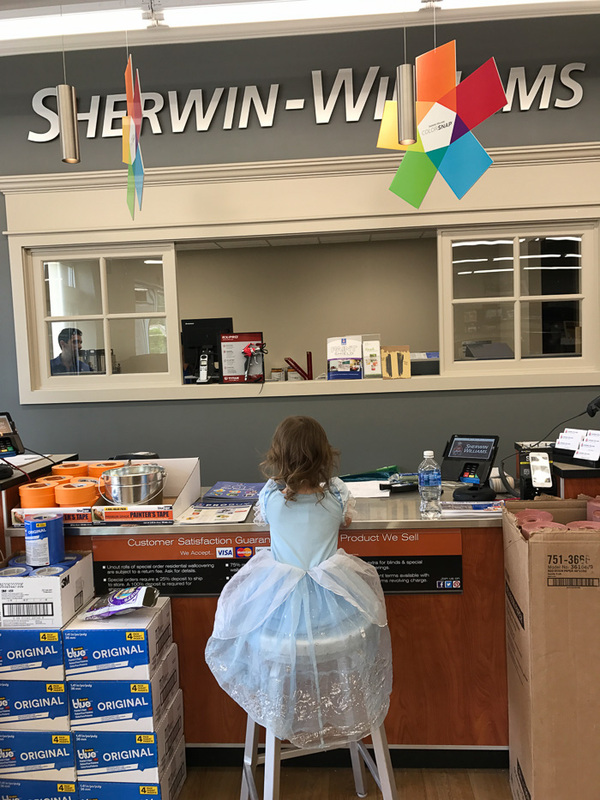 Your little helper is too cute in her dress! 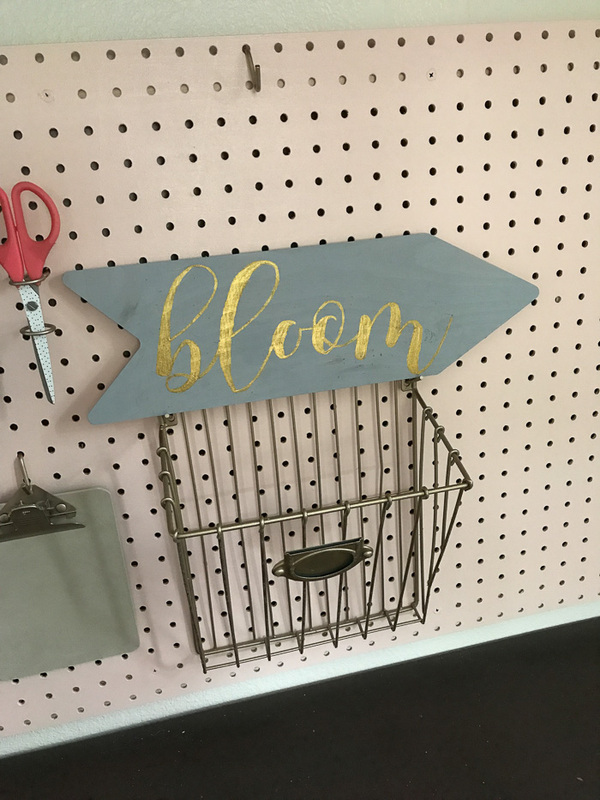 Love the blush color you went with! Haha, That’s all she wears these days! Thank you!! 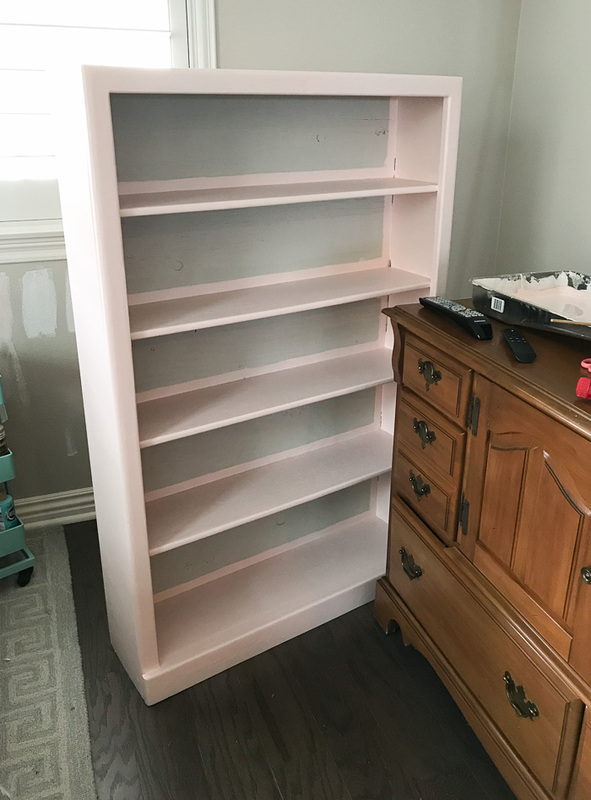 i love the pink paint you picked!